My latest video is all about two of my favourite things: saving money, and authentic weathering. (Yes, I need to get more of a life if these are two of my favourite things). It shows you how to make your own rust for weathering scale models, using two cheap household ingredients. Rather than pay $12 for a bottle of rust pigment, or $30 for a set of rust coloured paints, you can make your own jar of rust for about $1 which will last for years and years. The technique is very easy, but there is one important safety concern: make sure you do not inhale the fumes that come off the mixture when you first combine the ingredients. They won't kill you, but they can potentially make you rather sick indeed. Mix it outdoors, and stay back once it's been mixed for about 30 minutes. Be safe, people. As I mention in the video, I have since progressed to buying some pigments and colour paint palates for producing rust. But I have to say, this homemade technique gives you amazing rust textures, and for the price it's perfect for someone just starting out experimenting with rust weathering, or for someone like me who is a cheapskate and doesn't want to spend too much $$$ on hobby supplies! 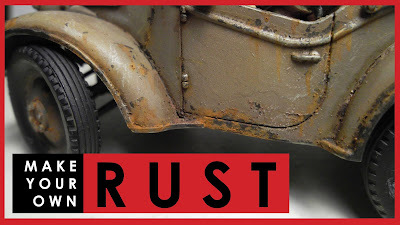 How to make your own RUST for weathering scale models.